In the arms race to squeeze more pundits with more laptops into a single stage, CNN has always held the lead. They're for keeping an up-to-the-second finger on the blogosphere's pulse, receiving sordid tips from 21st-century Deep Throats, yes? 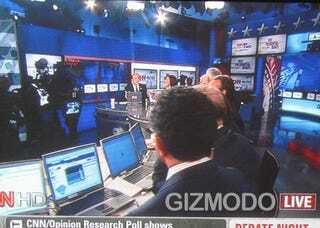 Tell that to CNN's legal analyst Jeffrey Toobin-what you up to on that screen there, Jeff?